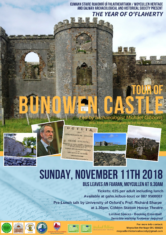 Archaeologist Michael Gibbons will lead the tour to an area once described as one of Ireland’s secret historic jems – visiting sites associated with the O’Flaherty’s at Bunowen Castle (with the kind permission of the Mac Donagh family). Prof. Richard Sharpe (Roderick O’Flaherty’s Letters) will give a pre-lunch talk at the Station House Theatre, Clifden entitled ‘Ruaidhrí O Flaithbheartaigh and his books’. Sensible walking footwear is required. There are limited spaces, so booking is essential. Tickets are €25.00 each including lunch at the Station House Hotel, Clifden. This page was added on 19/10/2018.